Romanesque painted Canopy of Tavèrnoles. Acquired by the National Art Museum of Catalonia, Barcelona 1906. Ref: 24060 MNAC. Romanesque canopy-type panel with its cut supporting beams still visible. 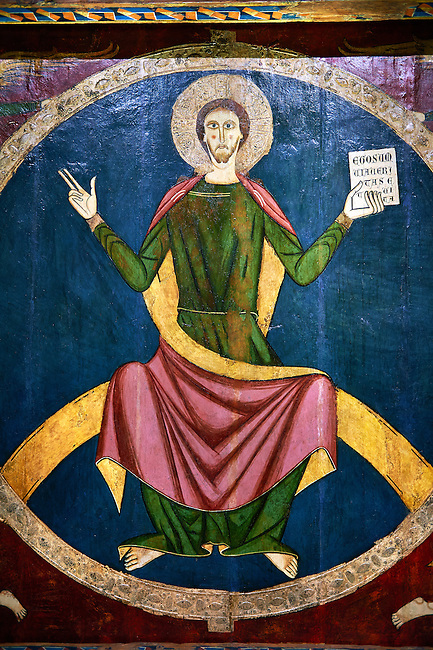 The panel is decorated with a painted image of Christ in Majesty or Christ Pantocrator in a mandorla which is supported by four angelic figures that evoke the theme of the Ascension. The canopy was discovered in the early twentieth century in the monastery of St. Sernin Tavernoles, half hidden by a Gothic altarpiece.